The Law of Empowerment looks at the attitude of leaders who are able to give power to others. In fact, it is only secure leaders who are able to power to others. Theodore Roosevelt said, "The best executive is the one who has sense enough to pick good men to do what he wants done, and self-restraint enough to keep from meddling with them while they do it." In other words, the Law of Empowerment involves finding leaders, building them up, giving them the resources, authority and responsibility, and then turning them loose to achieve. In short, the people's capacity to achieve is determined by their leader's ability to empower. However, a lot of leaders failed to abide by the Law of Empowerment because of their leadership insecurities. These leaders have the philosophy that says, "If a guy works for you, don't let him get too comfortable. Don't let him get cozy or set in his ways. Always do the opposite of what he expects. Keep your people anxious and off-balance." This mindset only deflates potential leaders instead of empowering them. A leader who empowers others is a secure leader who is not threatened by giving power to others. As John Maxwell said, "The number one enemy of empowerment is the desire for job security. A weak leader worries that if he helps subordinates, he will become dispensable." 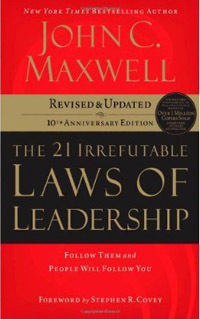 Maxwell continues, "The truth is that the only way to make yourself indispensable is to make yourself dispensable. In other words, if you are able to continually empower others and help them develop so that they become capable of taking over your job, you will become so valuable to the organization that you become indispensable." This is the Law of Empowerment. Two other barriers to empowerment are: resistance to change and a lack of self-worth. Only secure leaders are able to give themselves away. Empowering leaders are able to give other the credit. Abraham Lincoln was an empowering leader because he was able to give his power and authority to others. His security as a leader enabled him to give his power away. Therefore, only secure leaders are able to lead by lifting up others. This is the Law Empowerment. If you need to be secure to empower others, then you need to find strong and secure leaders to empower. Insecure leaders will more than likely only look after their own job security rather than empower others. The key to empowering others is a belief in people. To empower others is very powerful - not only for the person being developed, but also for the person empowering. After all, enlarging others makes you larger. It is a win-win situation. For more information about this subject, click on the law of empowerment.